Today, we are celebrating a momentous event in Siddha Yoga history and in the lives of countless people around the world. Exactly seventy-one years ago Baba Muktananda received Divya Diksha, divine initiation, from his Guru, Bhagavan Nityananda. This moment was one of unparalleled magnitude, leading to Baba’s spiritual liberation and to the inner awakening of innumerable seekers worldwide. 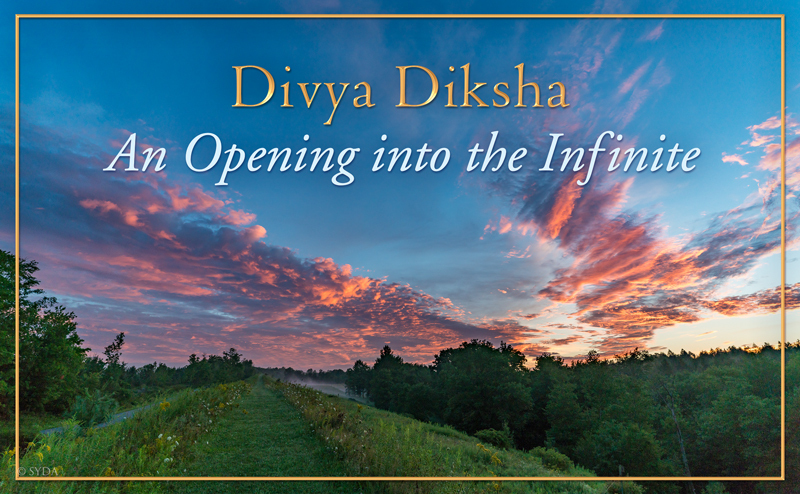 Divya Diksha refers to shaktipat initiation, which means, literally, “the descent of divine power.” Through shaktipat, Kundalini Shakti, the spiritual energy at the core of our being, is awakened by a Siddha Guru. This act of grace opens the door leading to the attainment of liberation. It makes it possible for us to live in the constant experience of our oneness with all creation. For many, this notion of oneness, of unity among all things, is a beautiful and poetic idea, a way of conceptualizing an underlying reality of life. Through shaktipat it is possible to make the shift from imagining this unity to actually experiencing it. Among all the forms of spiritual initiation, shaktipat is paramount. This transmission of grace from the Guru ignites an inner awareness of the Truth within our own being. Shaktipat brings to life our full potential as human beings. It makes it possible for us to constantly have satsang, to commune with the Truth. Satsang is Gurumayi’s Message for this year of 2018. Gurumayi teaches that to know the Truth, to have satsang, we need to be awake. The story of Baba’s quest for God illustrates how an inner awakening is essential to bring about knowledge of the Truth. At the age of fifteen, Baba left his home to find God. He spent over two decades traveling throughout India on foot, meeting many great saints and sages. Baba performed countless spiritual practices, memorized the yogic scriptures, and mastered a myriad of disciplines—from cooking to Ayurvedic medicine to hatha yoga. However, it was only after meeting his Guru, Bhagavan Nityananda, and receiving shaktipat diksha from him, that Baba had the inner experience of the Truth—Satsang. This is the extraordinary power of shaktipat: it opens our perception to the experience of the Truth. For all of us, no matter what we experience at the moment of shaktipat, one thing is certain. After we receive this divine initiation, and through our steady effort in sadhana, our lives are forever transformed. Many Siddha Yogis have shared that after receiving shaktipat initiation, they saw their lives, themselves, and their sense of connection with other people and with God transformed. They became filled with joy and lightheartedness. And they experienced a love that they had never even known existed. Life for them took on new meaning. What is it about shaktipat that can so dramatically change the course of our lives? That which takes place during shaktipat initiation—far beyond our mind and our senses—is truly astonishing. The foundational scriptures of the philosophy of Kashmir Shaivism describe shaktipat as the shattering of anava mala. This is a crucial event. The word anava comes from the Sanskrit aṇu, meaning “tiny” or “limited” and here refers to the condition of an individual soul. Mala means a veil or impurity. Anava mala refers to the innate conviction that we are separate from God. Out of compassion, the supreme Lord bestows his grace on seekers to dissolve their sense of separation from God and bring them back to the experience of oneness. The crux of shaktipat diksha is the dissolution of this sense of separation from God. Once this dissolution happens, we are on the way to recognizing that our true Self has the same nature as the Creator and all of creation. We are pure Consciousness. We are love. We are light. We have always been so and will forever continue to be so. Over the years, Baba and Gurumayi have offered Shaktipat Intensives around the world to give seekers the opportunity to know the true Self. They have also imparted to us many powerful and accessible spiritual practices and teachings—and for good reason! Our mental habit of seeing difference and separation still needs to be erased. While shaktipat diksha dissolves the anava mala, the mind must still be purified so the potential that is awakened through this initiation can be realized. Once the door has been opened with shaktipat, we must step across the threshold to our recognition of the ultimate reality. The practices of sadhana taught by the Guru allow inner stillness and clarity to naturally arise, so we can then begin to experience our true nature with greater frequency and depth. Every time we meditate, every time we repeat the mantra, chant God’s name, every time we offer seva or give dakshina or contemplate our experiences, we create space within ourselves to perceive the Truth; we strengthen our ability to have satsang. Through sadhana, we become the custodians of the Guru’s grace within. There is so much to celebrate on this anniversary of Baba’s Divya Diksha. By receiving his Guru’s grace, completing his sadhana, and following his Guru’s command to bring shaktipat to the world, Baba made what once was a secret initiation accessible to seekers worldwide. In this way, Baba made it possible for individuals of all backgrounds to know God within themselves. Baba’s legacy is alive in each one of us. His grace and teachings continue to enliven and inspire us as we walk the path of sadhana. And, of all of his sacred gifts to the world, we can thank Baba for this most profound one: entrusting his power to bestow shaktipat to our beloved Gurumayi, who continues to awaken seekers and guide them every step of the way on the path to liberation. 1 Swami Muktananda, Play of Consciousness (South Fallsburg, NY: SYDA Foundation, 2000) p. 79. Photograph of sunrise in Shree Muktananda Ashram taken by Swami Shantananda.